The thalamus receives input from the entire cortex. The cortex & thalamus like two nested spheres, innervating one another. Let us call such cortical-subcortical loops, reentrant loops. 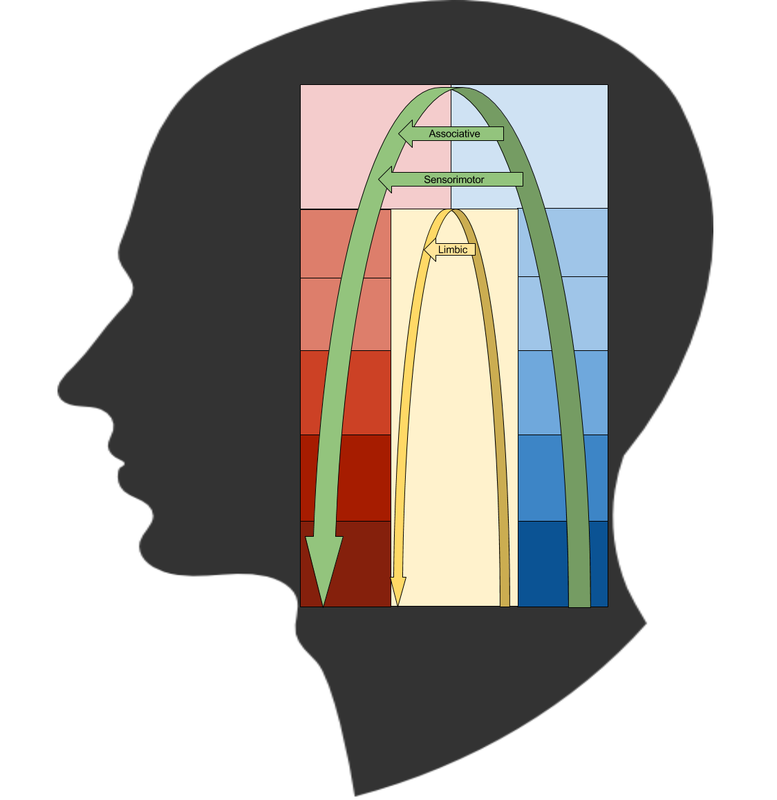 We turn now to the basal ganglia. The basal ganglia is innervated with dopamine, and contains an order of magnitude more dopamine receptors than any other brain region (Dawson et al, 1986). To understand this neurotransmitter, we must consider its biochemical signature. As a molecule, dopamine contains catechol (a kind of benzene C6H6) and a side-chain amine. Thus, it participates in the catecholamine family. Three particular catecholamines are major players in brain neurochemistry. Epinephrine (EPI), i.e. adrenaline, promotes the fight-or-flight response. Norepinephrine (NE) encodes perceptual salience. Dopamine (DA) is the currency of motivation and reward. Thus, catecholamines play a role in metabolic, perceptual, and motor arousal. In short, they are arousal systems. In the above cell groups, two dopaminergic cell groups are particularly important: A9 (SNc) and A10 (VTA). The nigrostriatal pathway emerges from the former, and the mesolimbic and mesocortical pathways emerge from the latter. 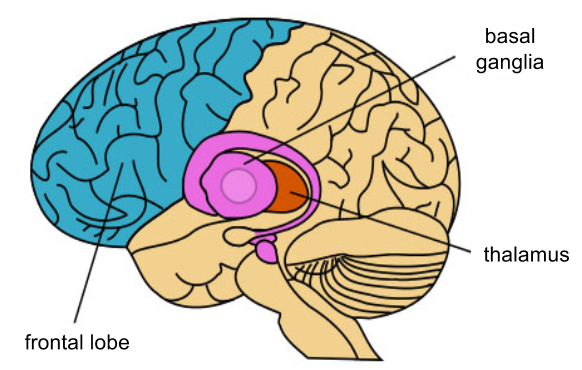 In the above, basal ganglia nodes are in purple. Black arrows are excitatory, red are inhibitory, green are dopaminergic. Consider the direct pathway. We see that the thalamus has an excitatory influence on the cortex. However, the GPi/SNr/VP node inhibits the thalamus. However, if an activated striatum inhibits the GPi/SNr/VP, the overall effect is “releasing the brakes”. The direct pathway is excitatory. In the indirect pathway, the STN buffers the GPi/Snr/VP “stop” signals, and attempts to “release the brakes” from the GPe is inhibited by the Striatum. Three inhibitory tracts along the indirect pathway are net-negative. Thus, the indirect pathway is inhibitive. The hyperdirect pathway has one inhibitory track (the GPi/SNr/VP “brakes”) – thus this pathway inhibits action. Why did evolution select two inhibitory pathways? One answer might rely on circuit length. The hyperdirect pathway bypasses several stages of the basal ganglia: perhaps its use was to accelerate the inhibitory signal of the indirect loop. D2-expressing MSNs only participate in the indirect pathway. The striatum receives input from the entire cortex. As such, the fibers which comprise the basal ganglia are rather thick. As our tracing technologies matured, anatomists were able to inspect these tracts at higher resolutions. In the 1990s, it was discovered that this “bundle of fibers” actually comprised (at least) three parallel circuits. All three circuits (direct, indirect, and hyperdirect) exist in all three loops (Nougaret et al, 2013); however, I omitted hyperdirect from the above for simplicity. 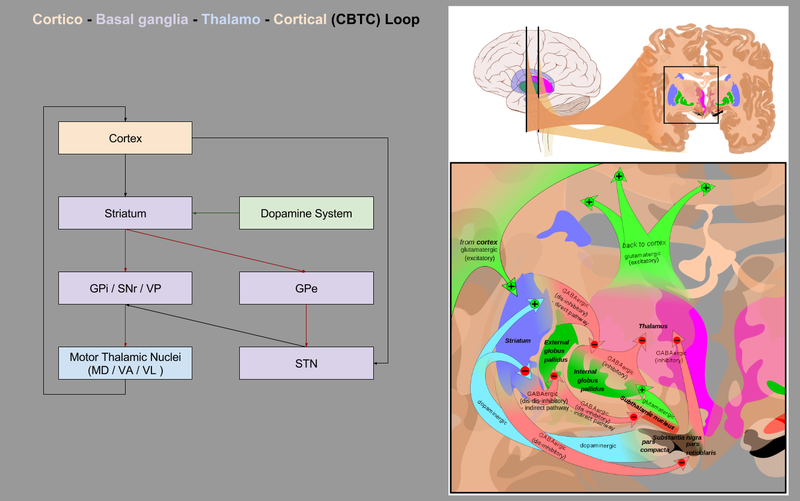 Given its participation in the Limbic Loop, the mesolimbic pathway is also sometimes referred to as the reward pathway. Its component structures, the ventral tegmental area (VTA) and nucleus accumbens (NAc), are particularly important. Why these loops, and not others? The tripartite loops correspond to three different levels of the abstraction hierarchy. The basal ganglia participates in motivation, decision making, reinforcement learning, and habit formation. If you are interested in basal ganglia function, these will be explored in my Neuroeconomics sequence. Joel & Weiner, 1997. The connections of the primate subthalamic nucleus: indirect pathways and the open-interconnected scheme of basal ganglia-thalamocortical circuitry. Nougaret et al, 2013. First evidence of a hyperdirect prefrontal pathway in the primate: precise organization for new insights on subthalamic nucleus functions. © Kevin Binz and kevinbinz.com, 2016. Unauthorized use and/or duplication of this material without express and written permission from this site’s author and/or owner is strictly prohibited. Excerpts and links may be used, provided that full and clear credit is given to Kevin Binz and kevinbinz.com with appropriate and specific direction to the original content.